The Bluffton University Nutrition Association (BUNA) will hold its annual Harvest Dinner, benefiting the Bluffton Community Assistance Corporation and the Churches United Pantry in Lima, from 5-8 p.m. on Friday, Nov. 16, at the Bluffton Middle School cafeteria, 102 S. Jackson St., Bluffton. 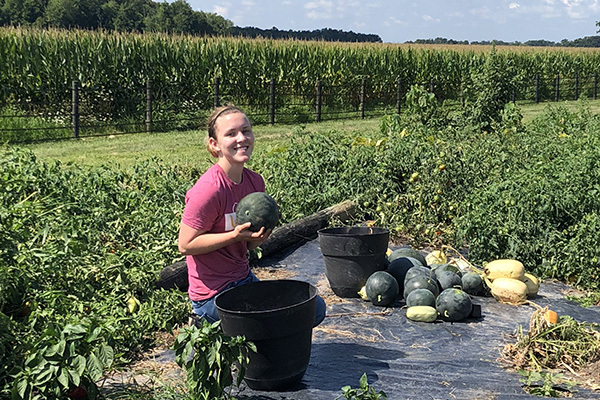 This year’s dinner will feature a farm-to-table concept with much of the produce coming from a garden maintained by dietetics faculty and students. The menu will feature Swiss chard potato gnocchi, homemade spaghetti sauce, roasted vegetables, whipped acorn squash and rolls with watermelon jelly. Desserts include peanut butter pie, caramel apple pecan cake and chocolate ganache cupcakes with coffee buttercream. Many Bluffton students are serving as volunteers with the meal. Bluffton University nutrition and dietetics students will prepare the food from scratch, students in the SERVE student service organization will serve the food and music majors will provide the entertainment. "This year is the 16th annual Harvest Dinner. Not only is it a great learning opportunity for nutrition and dietetics students to utilize the skills learned in the Food Service Systems Management class, but it also allows Bluffton students to give back to the community through donations to the Bluffton Food Pantry and CUP in Lima,” said Alexa Lammers ’19, BUNA president. “This event means a lot to the nutrition and dietetics students, and we appreciate the opportunity to give back to the community."